Work safety is one of the most important topics to be discussed in the forestry sector. The largest companies already have social responsibility policies aimed at workers, both in the field and in factories, so that effective health and safety measures are implemented and used correctly. Even so, we know that working in this sector can be accompanied by some risks and, of course, Timbeter is also an important tool for these risk factors to be easily avoided. 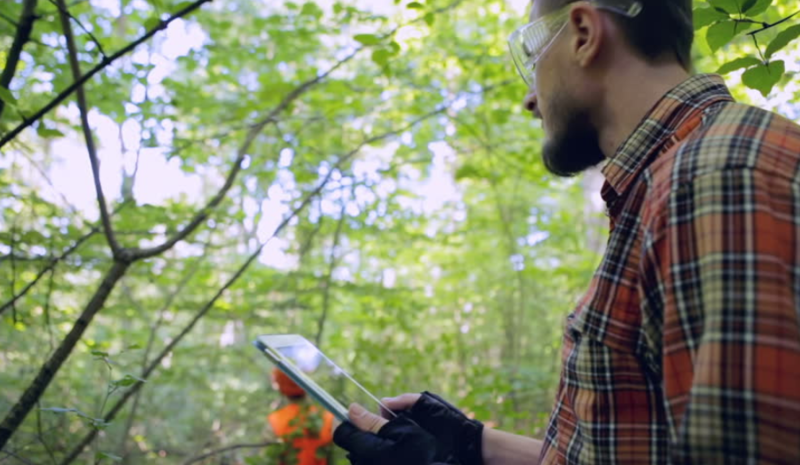 We have gathered some comments from our users and also from the team to explain why Timbeter is such a necessary and effective solution to maintaining worker safety and well-being in the forestry sector. Here, we present these points and reiterate that Timbeter does not replace the use of PPE or training provided by companies, but can be used in conjunction with these protection measures. Field work in open areas is always subject to different weather conditions. By using Timbeter for field measurements, workers minimize the measurement time of each pile, making work faster and more effective. In addition, in regions of extreme climates – such as for workers in remote areas of the planet who need to perform measurements in winters below -20ºC or those in tropical climates, whose summers exceed 40ºC, a simple photo taken with the aid of our solution will take only 10% of the time that would be used in a manual measurement, plus the fact that there is the possibility of just taking a photo from the stack and performing the measurement in an enclosed location such as an office. One of the most reported issues by log measurers on the field is related to repetitive strain injuries (RSI), since a single movement, performed countless times, is necessary in manual measurement – arms and hands being stretched repetitively for measuring the diameters and the volume of the stacks. These injuries also involve bursitis and synovitis, which require specific treatment and take time to be fully recovered. By using Timbeter as a preferred measurement method, the log-by-log “measuring” movement ceases to exist due to the artificial intelligence system that performs the measurement of the stack at once only in 3 minutes and doesn’t require human intervention directly on the pile. Attention: Take short breaks between measurements to avoid muscle and joint injuries. One other issue presented by forest workers is related to direct contact with wood piles, which can cause two distinct problems: risk of falls and venomous animals. Firstly, it is not completely safe for the measurer to be at a very small distance from the stack, as imbalances in it can occur, causing crushing and fatal accidents. In addition, it is well known that areas with an abundance of wood are the natural habitat of several species of animals, fungi and mosses. Workers in tropical areas who perform eucalyptus measurements, for example, are subject to unexpected encounters with scorpions, who prefer to lodge among logs – this is a situation of extreme risk that can be very easily avoided if the worker makes measurements further from the piles. When using Timbeter as a solution for measuring piles, the worker positions himself a certain distance from the pile, avoiding accidents due to unbalanced logs or meetings with venomous animals. Do you have suggestions on how Timbeter can be implemented for your day to day work safety improvement? Contact us at info@timbeter.com and give your suggestion.